Girls Rock Columbia (GRC) offers a weeklong music and empowerment camp each summer to girls, trans and gender non-conforming youth ages 8-17. But GRC is more than just a rock camp! Campers also participate in a variety of workshops that promote self-confidence, celebrate diversity, spark conversations about advocacy and social justice, develop art skills and cultivate new friendships. Camp is open to everyone regardless of musical ability. 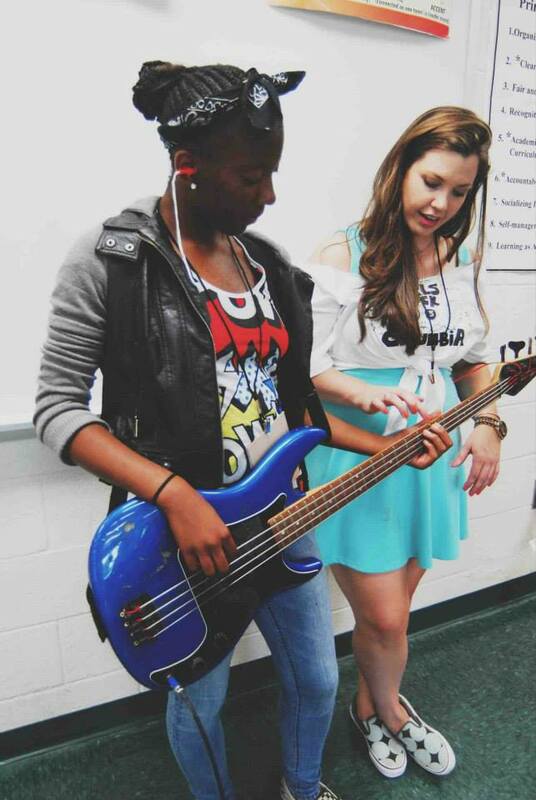 The Leadership Program is optional; teens are welcome to attend Girls Rock Columbia summer camp solely as campers. Registration: Complete the registration form by April 30, 2019. Registration for our 2019 Girls Rock Camp is now open! Sign up your camper using this registration form by April 30, 2019. Full camp tuition is $350.00 per camper for the entire week. We sincerely seek to support each child who wants to participate in Girls Rock Columbia and do not want camp fees to prevent any child from attending camp. To better serve a diverse economic population, we use an income-based sliding scale for tuition. Sliding scale enables folks to determine what best fits their budget. That said, know that your payment for GRC camp is subsidizing the cost in all its parts. We ask that you take into consideration both your financial needs and the financial needs of Girls Rock Columbia. What do campers get for that cost? This fee covers many expenses to provide an exceptional experience for the campers: including the camp and showcase facility rental, equipment acquisition, workshop supplies, daily snacks and many other costs that ensure a quality camp experience. Who gets accepted to camp? In an effort to create a diverse camp, we consider age, ability and camper interest to help form each of the bands at camp. Because of this, we do not accept campers on a first-come first-serve basis. If we have age brackets that fill up quicker than others, we will compile other applicants of that age on to a waiting list in an effort to include as many eager campers as possible. Want to show your support? Become a volunteer, attend one of our events or give to our mission.